Cate definitely was more about her little pool after our week at the beach and much time in the big pool. Plus Luke was here, so she’ll try anything he does. 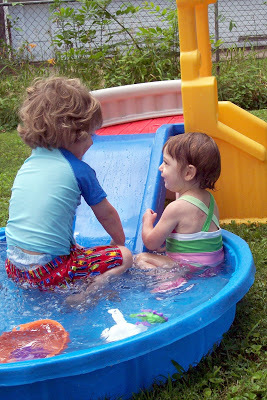 Luke let Cate borrow this plastic slide for the summer, so they had a lot of fun with that. They spent quite a bit of time trying to climb up it. Speaking of Luke, you can read for tales about him and his sister here. Just think of the scrapbook that you could do in 20 years when those two get married. They are so cute together and you can tell in the pictures that she just adores him.